Another note in the “Hi Honey” series to my lovely wife, Teresa. Another message in the “Hi Honey” series to my lovely wife, Teresa. Second, Thank You for your service, regardless of what your official rank and role were in the service! Likewise, I believe that every person who serves is due the same high honor, high respect, and many thanks. Third, Thank You for the price you paid during your service so that our nation’s freedom would be preserved! Fourth, Thank You for paying the price daily by enduring the wounds that you carry today as a result of your past service. Physical, emotional, spiritual, relational, financial, are just a few of the areas of a veteran’s life that are wounded in various measures as they served. Fifth, Thank You for enduring the tragic loss of your comrades and friends who paid the ultimate price for their service to our country, a price you yourself were willing and ready to pay. Sixth, Thank You for not giving up on yourself (and on us as a nation) as you daily may still be fighting a war, not on foreign soil, but within your heart, soul, body, and mind. A war called PTSD. Seventh, Thank You again! My words, as sincere as they are, can never match the weighty reality of what you have experienced and risked on our nation’s behalf. More specifically, on my behalf. May God Bless You on this Veteran’s Day, and on every day of your precious and valued life! ~ David J. Hall, A Free Citizen of the USA. I celebrate the dawn of every new day with a cup of coffee, thanking the Lord for everything. 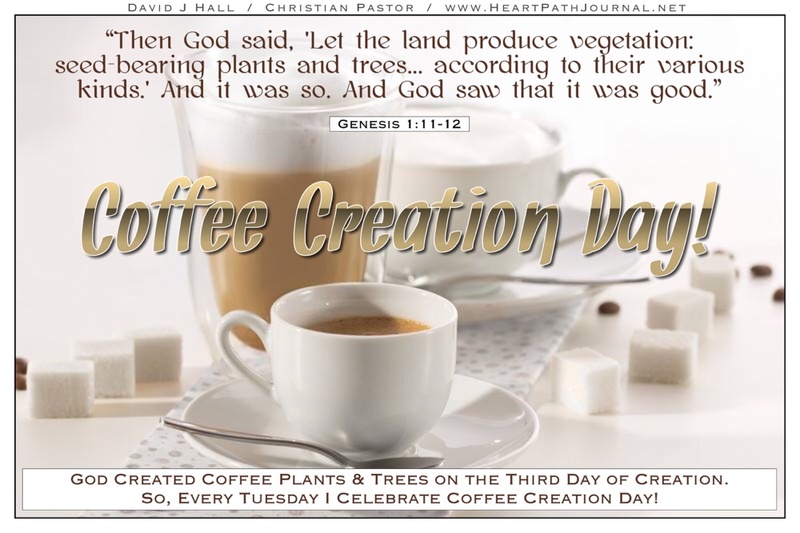 However, on Tuesdays I celebrate something extra special: God created the plants and trees on the Third Day of Creation, so that means that Coffee was born on the Tuesday of Creation Week. How do I celebrate Coffee Creation Day on Tuesday’s? With coffee, of course!